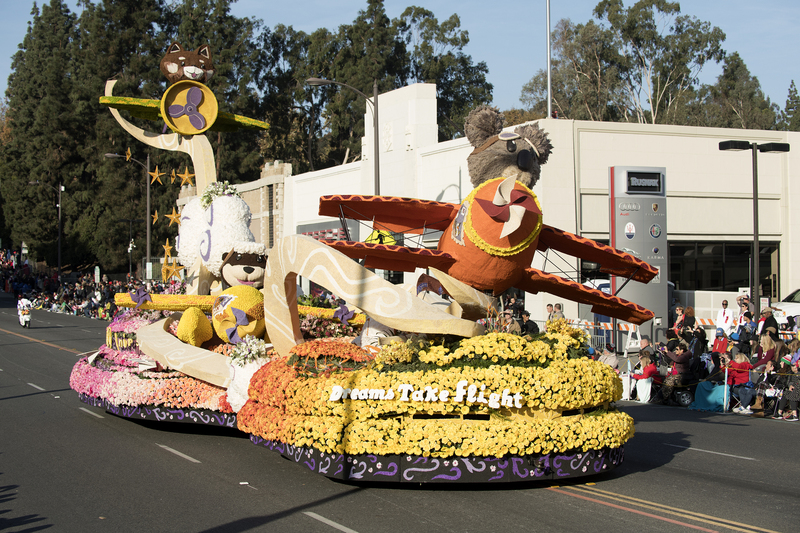 PASADENA, Calif. — Cal Poly universities’ milestone 70th float, “Dreams Take Flight,” received the Past Presidents Trophy for the most outstanding innovation in the use of floral and non-floral materials at the 129th Rose Parade® held New Year’s Day. The float, designed and built by teams of students from Cal Poly and California State Polytechnic University in Pomona, invited onlookers to take flight on the airplane wings of a trio of cuddly critters — a koala bear, sea otter and red panda. It celebrates the 2018 parade theme, “Making A Difference,” honoring those individuals in our communities who act in selfless, generous and kind ways to benefit others. “This year’s float flies high on a history built on Learn by Doing stretching back seven decades,” said Cal Poly President Jeffrey D. Armstrong. “While all Cal Poly alumni, family and fans revel in its beauty, the real treasure is not as obvious. It lies in the effort each individual brings to this yearlong endeavor and a fierce Mustang pride in its venerable heritage by our best and brightest students. “Dreams Take Flight” was among 44 floats in this year’s parade. The 18- by 54-foot entry used animation to breathe life into its trio of amiable aviators as they swooped and swayed amid the clouds. Paula the Koala, the largest element on the float, flew a striped-red biplane, controlling the craft’s flaps, rudders, ailerons and elevators as she glance between the sky and the audience. She led Ollie the Otter’s seaplane, which emerged from a cluster of moving clouds, while Rusty the Red Panda soared behind, banking left to right, some 28 feet above the float. The concept was selected from more than 100 ideas submitted last spring by students, local communities, alumni and friends of the Cal Poly Rose Float program. The design included a nod to Cal Poly’s rich parade history. Stamps of past Cal Poly universities floats were depicted on the planes in tribute. During the recent Decorations Week in Pasadena, the float was adorned with thousands of colorful blooms — including 10,000 roses, 10,000 Gerbera daisies and 1,000 irises. The bulk of the float was festooned with mums: 12,000 chrysanthemums; 7,500 yellow button mums; 3,000 green button mums; 1,000 orange cushion mums; and 500 purple cushion mums. Cushion mums, button mums, lemons, oranges and ilex berries covered the airplanes. A dense border of red roses surrounded the cockpit of the koala’s scarlet plane. The animals’ fur was a combination of buffalo grass, redwood bark, sheet moss and gorilla hair. Side elements used a combination of dry and fresh materials. Dried coconut and baby’s breath brought out the fluff in the clouds. Ti leaves, statice and strawflower decorated the kites and paper airplanes. Awards were announced by 2018 Tournament of Roses President Lance Tibbet about 6 a.m., two hours before the start of the 5½-mile parade down Colorado Boulevard. “This is a fantastic award, not one that we’ve ever won before,” said Josh D’acquisto, Cal Poly’s Rose Parade float advisor. “It’s huge. A large group of Cal Poly students cheered the announcement, he added. “We’re pumped,” said mechanical engineering major Sara Novell, the engine operator who rode on the float with a team of other students. The schools were also honored for their commitment to California’s flower farmers. It’s the seventh consecutive year the float has earned the “California Grown” designation from the California Cut Flower Commission, which recognizes an entry decorated with at least 85 percent of cut flowers and plant materials from the Golden State. The Cal Poly universities’ float has about 97 percent of cut flowers and plant materials from California, including white and lavender statice grown by students on the San Luis Obispo campus. The schools enjoy a rich history in the Tournament of Roses® Rose Parade. Cal Poly universities has the sixth highest number of appearances behind the city of Los Angeles (120 appearances), South Pasadena (108), and the cities of Alhambra (90) and Burbank and Sierra Madre (both 86 years). Since the fall of 1948, students from San Luis Obispo and Pomona have come together across 240 miles to produce the float — one of only six self-built entries — for Pasadena’s signature event. Since then, the two schools’ entries have earned more than 50 awards, including the Founders’ Trophy for the most beautiful float built and decorated by volunteers from a community or organization in 2017. In Cal Poly Rose Float history, Pomona student Don Miller is credited with spearheading the construction of the first entry. Built in the fall of 1948 in just 90 days with a $258 budget, an exciting Cal Poly tradition was born on New Year’s Day 1949, when an enormous rocking horse rolled onto Colorado Boulevard. In the years since “Childhood Memories” demonstrated the creative teamwork of the Pomona and San Luis Obispo campuses, the Cal Poly universities Rose Float Program has established itself as an award-winning leader in the New Year’s Day extravaganza that is eagerly watched by hundreds of thousands of people along the parade route and on television by an international audience estimated at more than 100 million. In addition to the scores of trophies received over the years, the program has received countless accolades for introducing innovations into its float designs including computer-controlled animation, hydraulic systems and cleaner emissions with propane. A symbol of the partnership between the two campuses is the float’s chassis, whose front and back halves are joined mid-October each year in Pomona to officially unite both the float and the teams. Cal Poly’s Learn by Doing ethos is exemplified in all facets of the float program, as students from throughout all six of the university’s colleges get hands-on experience welding, metal shaping, machining, foam carving, woodworking, painting and flower harvesting — ultimately competing against professional float builders with corporate sponsorships. The Tournament of Roses is a volunteer organization that hosts America’s New Year Celebration® with the Rose Parade® presented by Honda, the Rose Bowl Game® presented by Northwestern Mutual and a variety of accompanying events. 935 volunteer members of the association will drive the success of 129th Rose Parade themed “Making A Difference,” on Monday, Jan. 1, 2018, followed by the College Football Playoff Semifinal at the 104th Rose Bowl Game. For more information, visit www.tournamentofroses.com. Like us on Facebook and follow us on Twitter, Instagram and YouTube.